After DeGrom had gotten two quick outs in the first, Anthony Rizzo hit a double in the left center field gap. However, DeGrom was able to get out of the jam as Zobrist would next sky out to center field, to put an end to the top half of the first. The Mets almost put a run on the board when Neil Walker hit a shot deep into the right center field gap where Jason Heyward eventually made a leaping grab by the wall for the second out of the inning. Cespedes then laced a single up the middle off of Lackey before Bruce drew a walk to put runners of first & second. Duda who is 2-7 vs the veteran pitcher Lackey would drive one deep to right however it would come up just shy to put the inning to an end with the Mets stranding two. Heyward would lead off the second & wind up on second base due to an error. Heyward skied a pop out in the infield & Cabrera would bump into Reyes causing the ball to be dropped. The error would be charged to the Mets shortstop Asdrubal Cabrera. Cabrera would open the scoring in the second with his fifth homerun of the year. It would also be the 17th long ball John Lackey had given up on the season in only mid- June. The homerun would give the Mets the 1-0 lead. The Cubs kicked the third off with Kris Bryant & Anthony Rizzo both reaching base with one out to put DeGrom in a jam with Zobrist up to bat. After DeGrom got ahead on the count, 1-2 against Zobrist, DeGrom was able to induce a inning ending 4-6-3 double play to keep the Mets on top. The Mets would get Granderson & Walker aboard before Cespedes would roll over the first pitch from Lackey & ground into a double play. However, Jay Bruce would pick Cespedes up with a line drive homerun over the right center field wall for his 17th of the year & the Mets second of the evening putting the “Orange & Blue” over the Cubs, 3-0. Asdrubal Cabrera lead the fourth inning off with his second homerun of the evening & the sixth of the season putting the Mets up by four. After a couple of scoreless innings, Jay Bruce would lead off the sixth with a big double over Heyward’s head in right but Jose Reyes would continue his woes & leave him stranded at third to end the inning. The Cubs would finally strike in the seventh when Addison Russell took Jacob DeGrom deep with two outs, opposite field over the right field wall. It would go down as Russell’s fifth homerun of season, cutting into the Mets lead by 3. Travis d’Arnaud would rip a double out to left to drive in Jay Bruce as insurance & Jose Reyes would follow with his own RBI single to give the Mets the 5-1 lead going into the ninth. DeGrom would come on & finish up the ninth for the Mets earning the complete game win, only the second of his career, while hurling 116 pitches on the evening. 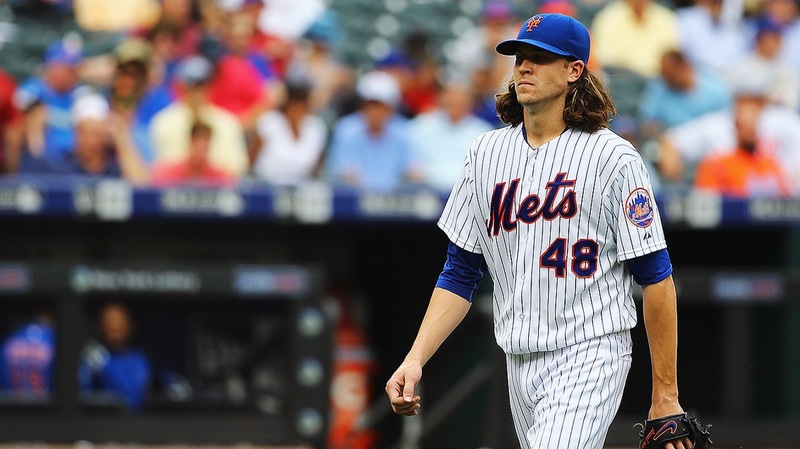 DeGrom would advance his record to 5-3 on the season while sporting a 4.33 ERA.